Tonight's thought from adults' aikido class: "Fight-or-Flight" has gotten us through the last 200,000 years, but it is not going to get us through the next 100. Starting November 1, 2010, Aikido Decatur will offer classes from our new dojo space at 104 Sycamore Place, Decatur, GA 30030. This is a modest yet comfortable new space that will allow the dojo to grow and expand. We will have more classes, longer classes, and finally a community space for more activities that we have not been able to enjoy to this point. We have loved our time at Decatur Healing Arts, and we are grateful to Susan Johnson for offering us such wonderful support during our first year. I knew the most I’ve ever known about aikido when I was about 4th kyu (in 1995 or so). One day a 70-year-old man showed up in our dojo (City Aikido in San Francisco) wearing a brand new gi and white belt. We trained together on ikkyo irimi, and I showed him several important details. He smiled and graciously said “Thank you!” over and over. The next night he returned to our dojo wearing a hakama(! ), and our sensei introduced him as Peter Ting rokudan. He had trained with O Sensei a couple times, and had practiced martial arts since he was four years old. He had even been a bodyguard for Gen. Patton in Europe in WWII. Within a month he was in the regular teaching rotation at our dojo where he taught until he passed away a few years later. The twinkle in his eye when I was “instructing” him taught me what aikido is all about. Aikido Decatur's adult classes these days focus on introductory material, basic ukemi, and the core techniques found on the fifth and fourth kyu tests. But even with basic technique, one can still practice the centering, grounding, the opening and allowing that transforms mundane movements into transcendent experience. No matter the syllabus, you can train your aikido. 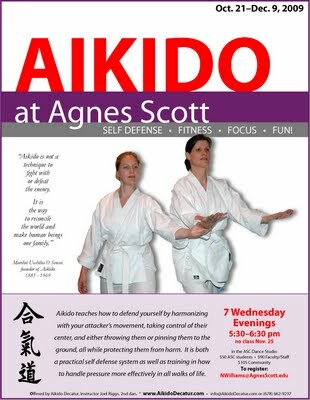 Starting October 21, Agnes Scott College will host a 7-week aikido class through their intramurals and community sports program. The course will be taught by Joel Riggs, 2nd degree black belt, and chief instructor of Aikido Decatur, a local dojo (school), and is open to the community. Aikido is a purely defensive, non-violent martial art which uses the attacker's energy to pin or throw them. It has been called "the Art of Peace," for it teaches self-defense techniques designed to protect the attacker from harm. When someone attacks, an aikidoist will move in the same direction and at the same speed as the attacker, blending with their energy without a hard impact. Once a connection is made, an aikidoist will use a joint lock or a throw to either control or get away from the attacker. Classes run for seven Wednesday evenings from 5:30 to 6:30 pm, with no class on November 25. Classes will be held in the Dance Studio on the Agnes Scott campus; the studio is between the tennis courts and E. Dougherty St., just west of the tall smoke stack. For more information about the instructor Joel Riggs or about Aikido Decatur, see AikidoDecatur.com. Email the following information to Nicole Williams, director of ASC intramural recreation, at NWilliams@AgnesScott.edu. You may also print and complete this form and place it in the Intramural Box located on the 3rd Floor of the Woodruff Activities Building. Make checks payable to "Agnes Scott College Intramurals". 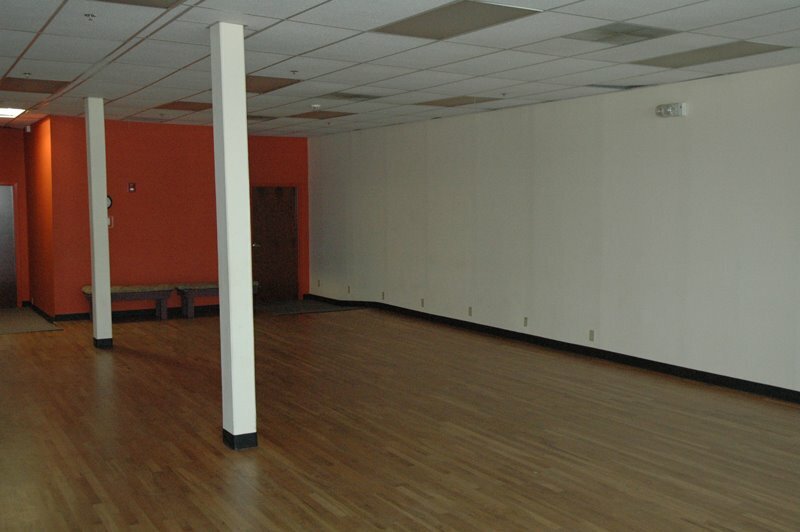 Starting Tuesday, August 18, 2009, Aikido Decatur will be moving to a beautiful new space at Decatur Healing Arts. While the Several Dancers CORE studio has been a great launch pad for our first Georgia dojo, the new space promises to take us to the next level. Yesterday I trained in a two-hour class led by Y. Yamada Shihan from New York, a student of O Sensei and the leader of the United States Aikido Foundation (USAF). I had trained with him before, and I remembered a mostly technical class from my previous experience. Today's teaching was no exception. The most interesting part of the day was standing on the front row as Yamada sensei led us all in breathing exercises at the very beginning of class. Even though it appeared he was just breathing and moving his arms in a qi gung style, I noticed that he dropped and wiggled his hips in order to settle into his center as the breathing progressed. Very subtle, but definitely apparent that he was centering himself here at the start of class. He didn't mention a word about this part of his practice. Also he closed his eyes for the entire breathing/warm-up portion of the class. Interestingly, I noticed that Yamada sensei dropped his head and looked at the ground throughout most of his warm ups and demonstrations. He also bent forward at the waist, and so I watched his movements to see the quality of "back" that he brought to the techniques. He definitely owned the center in his connections with his training partners. Before class, I noticed Yamada sensei sitting alone in a chair on the edge of the mat. I asked him, "when you were in a class taught by O Sensei, how did he let you know whether what you were doing was correct or incorrect?" Yamada sensei laughed out loud and said "Never, he never said anything." "You mean, he never fixed anything you were doing or told you something to improve your practice based on what he saw you doing?" I said. "No, nothing," he replied. At one point we were practicing ryote dori with a rear projection throw. Yamada sensei walked past me and said sharply "Keep your head down." and he pressed quite forcefully on the back of my head, pushing me toward the ground. He used only a few ukes during the class, all of whom seemed reverential and trained to provide exactly what was expected of them, no matter what. There was no dialog, no discussion, no question and answer, no exploration of any philosophy or attitudinal adjustment behind the movements, and no examination of the relationship of mind to body. There was no mention of O Sensei or of any principles of aikido beyond kokyu, which had been established as the theme of the day. This is not meant as a criticism, but frankly I did not feel I gained much direct new information or challenge or direction or inspiration from this class. Off the mat, Yamada sensei was not particularly engaging in conversation, beyond sitting with a few of the senseis from the various dojos represented at the seminar. There appeared to be a distinct hierarchy of association, most clearly emphasized at the moment of the group photo when George Kennedy requested that all instructors and yudansha of the two host dojos be allowed to sit on either side of Yamada sensei. I have respect for the fact that Yamada sensei trained with O Sensei and that he has much to teach. Now that I have trained with him several times, however, I have not yet discovered what his teaching might be. Perhaps one needs to train with him at length in order to learn the essence of his approach to the art. In training with students from the various USAF dojos, I noticed a distinct tendency to try to muscle me around. Given that this was my first day training in a class in almost a year (my last class where I was not the teacher was my nidan exam back on July 26, 2008), I decided to not raise any issue at all with anyone for any reason. If someone attempted to muscle me down, then I simply blended with their motion and felt around for the openings that their techniques created. I can't say that I found very many, but neither did I attempt to explore or exploit them. I just went with their motion, following their direction and energy. I also had one training partner (smelling of alcohol at 11:15 in the morning) who decided that he was going to explain to me how our katate dori nikkyo works, how it has a circle and a center, how there are various openings for strikes and kicks as the technique unfolds, all the while tapping out as uke before my nikkyo technique was even applied to him. Also, he responded to almost all of my techniques with a "Good!" or a "That's right!" Again, just as with those partners who muscled me around, I simply went with his direction and energy and did my practice. I met several wonderful people from dojos around the South, and look forward to visiting and training with them again in the future. I also found that I felt more deeply connected to my own teacher's approach to the art and felt more committed to the directions of training and teaching that I have begun in my own dojo. Thinking about summer camps for next year. It will be a natural once we land in our own dedicated space. "Joel did an incredible job engaging my students with special needs during his four-week introduction to the art of Akido. Students learned how to work together in a fun and memorable way. They are still talking about the shadow game and greeting each other with a bow. Students from all walks of life could benefit from this instruction." During April and May, Ms. Fraser's ESS students are enjoying weekly visits from Joel Riggs, the head instructor from Aikido Decatur. Riggs Sensei has taught the small class of six to eight students movement and games, including the Mirror Game, the Shadow Game, Earth/Air/Fire/Water, and Bad Restaurant. Students learn to respond peacefully when someone crowds them or shoves them or grabs them. They have learned that when the pressure is on, it's time to relax, breathe, and respond effectively without hurting your attacker. "Ms. Fraser's charges brings lots of energy and enthusiasm to their training, and they seem to like the games and the movements we do together. At the end of the first class, they took the time to draw a picture or write a poem to express their thanks. These were great gifts they gave to me!" Riggs said. Aikido is a non-competitve, non-violent martial art that uses an attacker's energy to render the attack harmless. 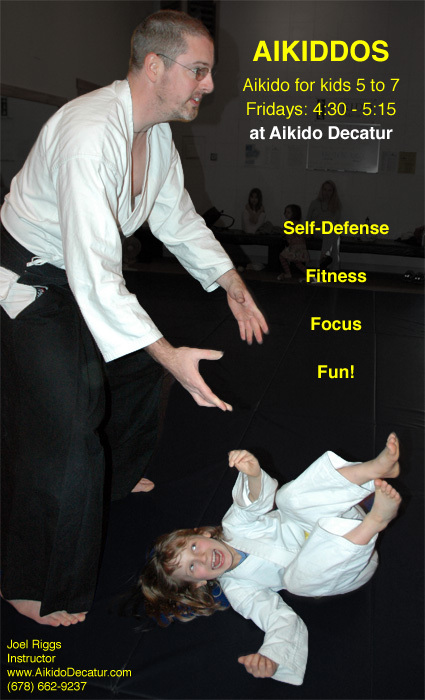 Aikido Decatur offers classes for ages 5-7, 8-12, and 13 to adult (www.AikidoDecatur.com, or (678) 662-9237). Joel Riggs, a 2nd degree black belt, began training in 1993 in San Francisco, and he moved to Decatur in Fall 2008 with his wife and young son. Ms. Fraser's class includes Kyle Braunsroth, Arkeyvion Coles, Ronan Derro, Shamya Kelly, Ross Pousner, Lena Rosen, and Tamia Swint. I am currently offering a four-week series of aikido classes to students in K through 3rd grade at Winnona Park Elementary School here in Decatur. I thought you would enjoy a couple photos of me with the kids. They love the exercises we practice and the games that we play, games that come from aikido movements. Due to widespread interest in a younger kids class, starting this month, April, Aikido Decatur now offers Aikiddos: a class for children 5 - 7 years old on Fridays from 4:30 to 5:15 pm. Aikido is a purely defensive martial art in which you learn to control your attacker by blending with their energy and momentum and leading them to a joint lock position or a throw. But aikido is much more than just techniques for fighting. Aikiddos will focus on awareness, balance, coordination, and cooperation. There are many aikido techniques which can be adapted for younger children, but others must wait until kids are old enough to roll safely and can protect each others joints and bodies. I have already started a series of classes to introduce aikido into Decatur Schools. On April 1 I led a session for a group of special needs children at Winnona Park Elementary. What a great group! The room was hopping with kids training together, leading each other around, and laughing. I think their favorite exercise was pretending to be a drop of water on someone else's arm, and maintaining their connection as their partner moved all around the room. I am contracting with Decatur Rec. to offer classes via the summer Playbook. Classes will be held in the dojo, but the Rec. Dept. will be the organizer for a four-week series of Tuesday sessions for both kids and adults in June. And now it looks like I will be leading a four-week after-school enrichment series at Glennwood School for the Whiz Kids program, starting after the Spring Break. Stay tuned for details. Due to the demand for a younger kids class among the many families I have talked to, I am pleased to announce that starting this month (April) Aikido Decatur now offers Aikiddos: a class for children 5 - 7 years old on Fridays from 4:30 to 5:15 pm. The second hour on Tuesdays will still be for youths and adults 13 and over. This younger children's class will focus on awareness, balance, coordination, and cooperation. There are many aikido techniques which can be adapted for younger children, but others must wait until kids are old enough to roll safely and can protect each others joints and bodies. Families and friends, of course, are invited to watch tests, and you will know at least a week in advance of the date for your demonstration. Unlike many other arts and dojos, Aikido Decatur does not charge for testing or promotions; a new color belt is $5. After several months of intermittently attempting to configure PayPal for use on the main dojo website (www.AikidoDecatur.com), I think I have finally got it working! Sometime soon someone will be the first to attempt to pay their initial three-month dues via the online form. It's now more convenient than ever to join! Aikido Decatur is interested in offering martial arts classes for children 4 and up through Decatur-area schools, after-care programs, and other suitable venues. Aikido is a purely defensive, non-violent martial art which uses the attacker's energy to pin or throw them. It has been called "the Art of Peace," for it teaches self-defense techniques designed to protect the attacker from harm. As much as it is a physical practice, it is also a study in conflict resolution, relationship, and listening. The physical benefits for children who study aikido include improved body control, energy, strength, flexibility, and overall fitness. As a relationship practice, children learn to observe and listen to those around them with keen attention, to cooperate with and even contribute to others' movements and intentions, and to express themselves more confidently and clearly. And as a martial art, they learn how to defend themselves when attacked, how to effectively control an aggressor without causing injury, and how to defend against multiple attackers. The principles and techniques of aikido make it accessible for persons with all degrees of initial fitness, strength, and experience. By emphasizing moving harmoniously with others instead of trying to overpower them, aikido is as effective and suitable for girls as it is for boys. In a school or rec department course of anywhere from 1 to 12 classes or more, students can receive an introduction to the practice of aikido, learn basic techniques, and begin to learn how to move their own body and adjust their own attitudes when attacked. They will be introduced to several basic but effective techniques, will begin strength and flexibility training, and will learn how to train safely at all times so as to never cause injury to any training partner for any reason. In its regular schedule, Aikido Decatur offers classes to children 8 to 12 and to youth and adults 13 and over at its dojo on the square in downtown Decatur. Joel Riggs (2nd dan), the chief instructor at Aikido Decatur, began training in San Francisco in 1993 with Robert Nadeau (7th dan), a student of the founder of aikido Morihei Ueshiba O Sensei (1883-1969). Joel Sensei moved to Decatur with his wife and son in late 2008. More info available at www.AikidoDecatur.com. Today the first adult students appeared at the dojo, one on his first day, and the other a white belt visiting from Florida. After two months of being just a rented room for stretching in, the dojo got in gear with an adult class following the regular kids class back-to-back. So, what do you do with a visitor and a first timer? I checked in with them to see whether they wanted to stretch, and they did, so we stretched for about 10 minutes. Then, instead of delving into some complex technique, we led off with simple ma-ai practice, threatening to attack kata-dori while nage maintained distance by stepping backwards. Once we reached the edge of the world (the edge of the mat), we reversed uke/nage and went back the other way. With this simple exercise we began to feel the connection between beings and started to open to the energy coming in from our partner. Then, we added an actual kata-dori attack. Nage then deepened the connection by securing uke's hand to the shoulder being attacked, then turned inside, extending uke's arm, and leading uke into a long forward lunge and turn that inevitably turned into a backward sit-fall. Very gentle, good for first timers and for strangers from afar. Nothing dangerous or joint intensive. After exploring this shape for about 20 minutes, getting our feet and hands working in some semblance of coordination, we took a break for a moment. "How and who are you when you do this technique? What are you working on right now?" I asked. The first-timer had a classic quote: "How do you do this without thinking about it?" I had mentioned to him earlier that he could move his body more and spend less time standing and scratching his head. "Exactly right!" I replied. "If you train with that question in your mind at all times, you will progress far and very fast in this art." He looked at me a little quizzically when he realized that that was all I was going to say in that moment, and then a smile came across his face. The white belt then asked, "are you grabbing their hand and trying to pull them, or are you just turning?" Not knowing what to say to him, I invited him to attack me. I connected with him, led him just beyond his comfort range, and turned, resulting in him falling softly in front of me. "I'm not sure I know what to say," I told him, "but does that answer your question?" "Hai, sensei," he said excitedly. We then spent a few minutes doing the old Richard Moon practice of training with an 'imaginary uke', an invisible partner. Making the shapes by yourself makes it abundantly clear that it is NOT uke's fault that a technique is difficult or that you are falling off balance in the middle of it! "Take a moment to feel what it's like to be completely awesome at this technique, and at training in general," I told them. "How would you be, how would you move, how would you look if you were the best in the world at this technique? What is different for you?" The usual replies came forth "I'm breathing more consciously, I'm moving with a rhythm, I'm not thinking about it so much, I can feel my feet on the floor more, I feel heavier." All the regular signs that nage is opening and allowing more, getting their head, their thinking selves out of the way. I went on, "so, let's take advantage of O Sensei's great gift to all of us, and let us take these great physical and spiritual insights back into the world of moving, functioning technique, where the s*** hits the fan!" We trained for another 10 minutes. Halfway through this last segment I reminded them, "Let's not forget all the wonderful changes we manifested in our being a few minutes ago. As the energy and the movement and the speed increase here a little bit, let us continue to open and allow, to focus on who we are less than on how we can manage to throw our uke." I could see lights going on in their eyes as we continued training. I had a wonderful time, and, by report, so did my two students. In teaching today I glimpsed once again the power and the possibility of all that I have received from my teachers (Robert Nadeau, Richard Moon, Nick Scoggin, and many more) over the years. Over and over through teaching, I discover the layers upon layers of this art and I realize how little I have scratched its surface. I look forward to the next class when an adult student might appear! In our children's class at Aikido Decatur (Georgia), we play a game called "Lucy and Harpo". Sometimes we call it the mirror game. Each person and their partner take turns leading and following, acting as the mirror image for their partner. The two stand on either side of a line on the mat, which serves as the marker of where the mirror is. Aikido Decatur is now in full swing, with classes two days a week. We have three students to start, and the introduction to aikido has begun. The next goal for this dojo is to spread the word around town, to everyone who works with children 8 and older, as well as to teens and adults. I have a list now of all the administrators of City of Decatur schools, and so I will be emailing them a promo piece within the next week. If you know of anyone who would be interested in checking out the art, please remind them they can try a class for free, and that beginners and visitors are always welcome. Also, you can send them to AikidoDecatur.com for more info. The mats arrived, with two hours to spare. So, on January 6, we had our first class. One student showed up, got her uniform, and away we went! I've spent the first couple weeks getting used to the space, to the neighborhood (there's lots of noise and some sketchy characters right outside the front door), and to the drill of moving the mats in and out of the space every class day. All in all, though, the room is working out well. In week 3 we signed up a second student, and now we are spreading the word. I'm reaching out to neighborhood listservs, the town's rec department, and am posting flyers on bulletin boards all over Decatur. If you know someone who you think would enjoy training, send them along for a FREE CLASS! The dojo mats are still not here! Only two more days until the first class, so it's getting down to the wire. Word from the vendor, Ten-O.com, is that they arrived in the shipping company's warehouse on New Year's Eve, and will be delivered to me on Monday, tomorrow. Let's hope that it works out! For now, it looks like there won't be storage at the Several Dancers Core space, our first location. That means I will have to haul them in and out of the building and store them here at our house for the foreseeable future. While the SDC space has lots of good qualities, this mat situation is just more impetus to graduate to our own permanent dojo space as soon as possible! 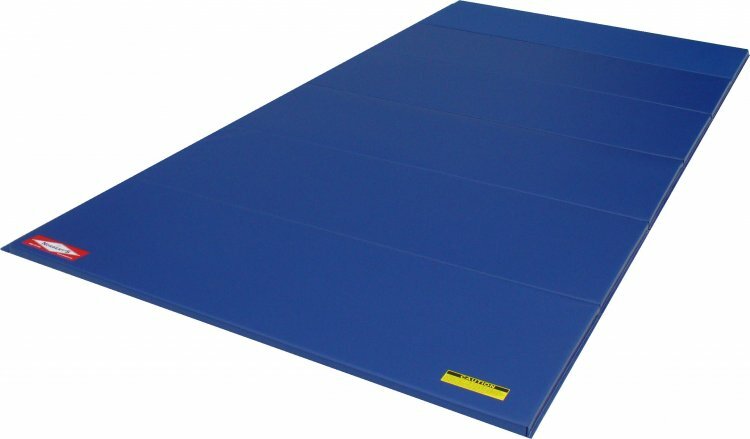 I have just ordered four 7'x14' blue folding 2" mats from Norberts, the same mats we used back at my dojo in California, just bigger. They should be arriving before Christmas. We'll be rolling soft and cushy when our classes start! Aikido Decatur opens January 6, 2009, at the Several Dancers Core studios in downtown Decatur, GA. The dojo is at 139 Sycamore St., which is actually the sidewalk between Church St. and McDonough St., on the south side of the Decatur Town Square. Great exposure onto the Decatur Town Square. Wonderful long expanses of hardwood floor make for an excellent mat space. 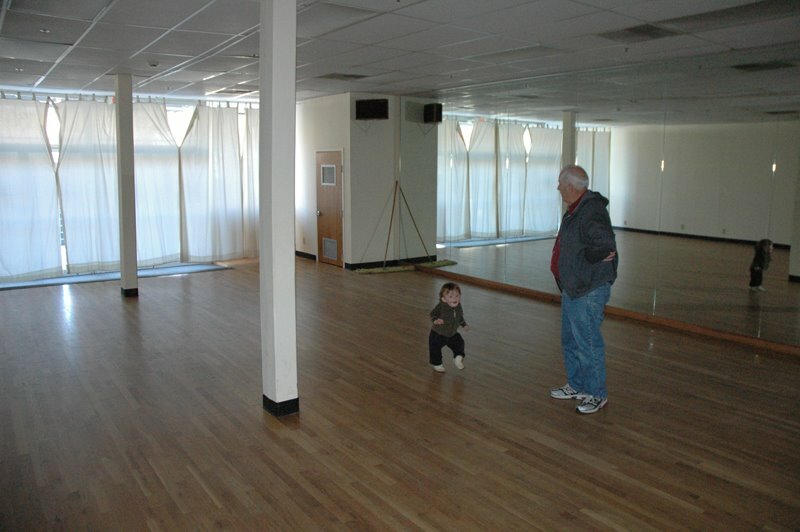 My father and my son explore the new dojo. Aikido Decatur, a new aikido dojo in Decatur, GA, has sub-leased space in downtown Decatur, at the dance studio of local dance company Several Dancers Core. Located at 139 Sycamore Street, the new dojo space sits directly on the Decatur Town Square, a hub for commuters, town residents, and frequent community events. Classes at the new space will begin January 6, 2009. Sign ups are now available at the dojo's website. Aikido is known as the 'gentle martial art', since it emphasizes controlling one's attacker without harming them. Founded in the 20th century by Morihei Ueshiba O Sensei of Japan, aikido evolved from the more destructive martial arts that had dominated the samurai era of Japanese history. Aikido Decatur offers classes for children ages 8 and over, and for teens and adults ages 13 and over. It was formed in January 2009 by Joel Riggs, 2nd degree black belt, who recently moved to Decatur from the San Francisco Bay Area. More information can be found at www.AikidoDecatur.com. Aikido Decatur, a new dojo near Atlanta, will hold its first classes on January 6, 2009. Led by Joel Riggs, 2nd dan, Aikido Decatur offers martial arts classes for children and adults, two days a week, at the Several Dancers CORE studio on the square in downtown Decatur, GA.
"Aikido is a marvelous art that includes physical training, a positive philosophy, discipline and fun simultaneously, and that builds community. It has been called the 'gentle martial art' for the pressures of every day life." --Joel Riggs, chief instructor. Ai-ki-do (literally "Blending - Energy - Way") is a relatively new Japanese martial art that emphasizes neutralizing and rendering harmless an attacker, without injuring them in any way. Founded by Morihei Ueshiba, O Sensei (great teacher), aikido grew out of the founder's deep experience in other martial arts and Japanese religious traditions. Born in 1883, just 15 years after the end of the samurai era, O Sensei redirected the focus of martial arts from maiming and killing to avoiding danger and protecting one's attacker. He taught that one who attacks another has inherently broken the natural harmony of the universe, while the one being attacked can, with proper attitude and movement, control the attacker and in so doing restore harmony. An aikidoist learns to always be ready to align with and move with an attacker's incoming energy. By blending with the attack, one can avoid getting hit and then can immediately control the attacker's body, either pinning or throwing them. For children, aikido practice builds self-awareness and self-control, trains and strengthens the body, and teaches how to defuse conflicts and prevent fights. For adults, aikido training keeps the body strong and flexible, allows for more robust energy movement through the body, and focuses on undoing the learned separation between the body and mind. As a practice of relationship, aikido training often has many positive effects in all areas of life, including marriage, business, and community. At Aikido Decatur, classes are both technically sound and rooted in the art's philosophy as passed on by the founder's students. Beginners and visitors are always welcome, and all aikidoists of any background are sincerely invited to visit and participate. Parents can train with their children in the children's classes. Joel Riggs, b. 1964, began aikido training in 1993 with Robert Nadeau Shihan (7th dan), head of City Aikido in San Francisco, co-founder and division head of the California Aikido Association, and a student of O Sensei in the early 1960s. Other primary instructors at City Aikido included Nick Scoggin (6th dan) and Richard Moon (5th dan). Joel has also trained with several other students of O Sensei, including Mitsugi Saotome, Yoshimitsu Yamada, Frank Doran, Henry Kono, Mary Heiny, and Gaku Homma. Most recently he was an assistant instructor and director of the children's program at Aikido of Marin in Fairfax, CA. With his wife and son, Joel moved from the San Francisco Bay Area to Decatur, GA, in 2008. Children 8 to 12 (including parents), Tuesday and Friday, 3:30 - 4:30 p.m.
Ages 13 and over (including adults), Tuesday and Friday, 4:30 - 5:30 p.m.
With 3-month sign-up, annual membership fee is waived and uniform is included. When you check out a restaurant, do not look at the menu or the food. Instead, look at the other patrons. Are they thin and healthy? Or overweight and sedentary? If you eat there, you will grow to look like them. The same way, when you are searching for a dojo, do not look at the teacher or the building or the mats. Instead, look at the students training there; if you train there, you will become like them. As I have traveled around the country and have trained in different schools, some have an open and friendly vibe, while others are serious, or shy, or, unfortunately, rude sometimes. That's all OK. As a visitor I can train almost anywhere once. And if I feel in danger or that my training isn't productive in at least some small way, then I simply bow out. No big deal. One thing I don't mind is when my training partners tell me "do this, do that, no you're not doing this right, etc." Sometimes they have a valid point, and sometimes they are just reflecting the energy in their dojo as a whole. Either way, it's good information for me, and I don't see their attitude as a reason to get upset and reactive. So, when you go to check out an aikido school, see whether students there greet you (and not just the designated greeter), see whether your questions are answered, whether you are made to feel welcome. If so, then you will know that that dojo will engender those qualities in you. Remember, one very important part of aikido is "extending ki (energy)," and those aikidoists who extend their hand to you when you walk in the door are probably training extending ki on the mat. In my experience, those who don't probably aren't. Welcome to Yonkyo.com, a blog about training, teaching, and exploring aikido. Why "Yonkyo?" Yonkyo - literally "fourth technique," is one of the basic aikido techniques created by O Sensei. As a beginner, yonkyo can be frightening, for it is painful (but doesn't injure). Over time, though, a student learns to tolerate the initial discomfort of yonkyo, and soon learns that the pain it causes is not a substitute for a properly applied technique. When you try to apply yonkyo to a very senior student, the pain points that worked so well on another beginner suddenly have no effect at all! You realize that you have so much more to learn about this technique. Even after years of practice, one's experience of yonkyo continues to evolve, both as nage and as uke. I hope that this blog will chronicle the evolution of my own growth in aikido, in teaching, in running a dojo, and in forming and nurturing a community.